Olympic Alpine Skiing. Speed racing on the very edge…. Olympic alpine skiing didn’t just begin lately. Well the Olympic part didn’t anyway. Many years before it was called a sport, skiing was an important means of transportation. It‘s not clear as to who started it first but , but there is evidence the Scandinavians were using skis to move about the land while they hunted and fished for food. Historical artifacts have been found dating back over 4,000 years. The first Alpine skiing event, a form of downhill, took place in the 1850s in Oslo, Norway. It was the very beginning of what we know today as olympic alpine skiing. Alpine distinguishes this type of skiing from Nordic or cross country skiing. The alpine being high mountain. It was in the early 1920s that organized slalom races were organized and eventually races leading to the world championship in 1931. Soon afterwords, the Americans got the bug and the sport took off throughout the 1930s leading to the Olympic alpine skiing we know today. There will be five events each for women and men in whistler in 2010 Olympic alpine skiing. . Downhill: the steep decent race against time. This race features the longest course with the racers reaching the highest speeds. The skiers make a single run down the course and the fastest time determines the winner of the event. Slalom: a short downhill race with many sharp turns around flags. Similar to the giant slalom, each skier must make two runs down two different courses laid out on the same slope on the same day. Normally they ski one run in the morning and one in the afternoon. The fastest time determined the winner of this Olympic alpine skiing event. Giant slalom: a longer, more sweeping version of the slalom. Commonly called the GS. The course has fewer turns and the turns are wider than the slalom. Each skier must make two runs down two different courses laid out on the same slope on the same day. Normally they ski one run in the morning and one in the afternoon. The fastest time determined the winner. Super G: Super-G stands for super giant slalom. The event combines the speed of downhill with the more precise turns of giant slalom. The Olympic alpine skiing course is laid out shorter than downhill but longer than a giant slalom. Each skier makes one run down the single course and the fastest time determines the winner. Combined: The combined event consists of one downhill followed by two slalom runs. The times are then added together and the fastest time determines the winner. The combined downhill and the combined slalom are contested independently of the regular downhill and slalom events, and the combined courses are laid out shorter than the regular versions. 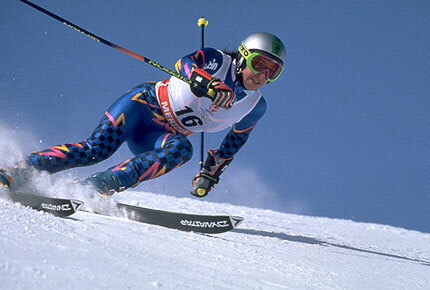 Western European skiers have dominated the sport over the years. Austria has been the big winner many times. The first Winter Olympics were held at Chamonix, France in 1924. The events included Nordic skiing and ski jumping events only. Then in 1932, at Lake Placid, cross-country skiing was added into the Olympic itinerary. However, Olympic Alpine skiing events including the popular downhill skiing were not included in the Olympic competitions for quite some time. This was because of a lack of infrastructure and proper skiing equipment necessary for hosting such events. After the development of lifts, gondolas, and better equipment, downhill skiing events became more prominent. Alpine skiers could use these lifts and move up the slopes easily. This made practicing and enjoying the sport easier without being exhausted due to the steep climb on foot. Eventually, at the 1936 Games in Innsbruck, Austria the Winter Olympics hosted the first exclusive olympic alpine skiing competition. Skiing has developed into a glamorous outdoor winter sport and Olympic skiing is very popular nowadays. Skiing in the Olympics is not only about winning gold medals but its something more than that. Olympic skiing events are a launching pad where various companies, banks and corporate institutions may market their products. Famous skiers are endorsing top brands such as, Head, Sun Ice, Fischer and numerous other brands manufacturing sports accessories, clothing, sports equipment, etc. The induction of skiing in the winter Olympics brought international acclaim to this ancient and traditional winter activity. Skiers of every caliber from across the globe participate in this popular event representing their respective countries. There is a great deal of pride that comes with marching in the opening ceremonies with your countries flag displayed proudly. The winners often choke up while speaking of their feelings of pride during interviews. The 2010 Vancouver Olympic Winter games will be attended by people from around the globe. The alpine skiing event will be held at Creekside in Whistler. Updated Sun. Apr. 24 2005 8:24 PM ETCTV.ca News StaffIllanaaq the Inukshuk was unveiled Saturday night as the logo of the 2010 Vancouver Winter Olympics. Illanaaq is Inuktitut for "friend," while an inukshuk is a traditional stone marker used by the Inuit to guide their way across the sometimes featureless Arctic. "It is amazing to see our logo larger than life," said Elena Rivera MacGregor Saturday night after the logo was unveiled. Theodora Mantzaris, who also designed the logo for the 2004 Summer Olympics in Athens, explained why the design resonated for her. "You see I'm Greek, I was seeing it (an inukshuk) for the first time and I felt somebody welcoming me. So I thought it was a strong emblem," said the judge. "Something that appeals to young people and you know, I think there's a bit of our personality, the Canadian personality in it, saying, 'Here: This way to the podium, this was to the finish line'," said judge Steve Mykolyn. "After a lot of research, it was the only item that represented culture, the environment, people, Canada," Rivera MacGregor said. The competition began last June. After reviewing 1,600 entries from across Canada, the international panel of nine judges chose the design by Vancouverite MacGregor -- who was rewarded with $25,000, two tickets to the opening ceremonies of the Games and the first two pins based on the design. The choosing of a logo is considered a gamble, with the outcome having a potential business impact of millions of dollars.While the five Olympic rings are one of the most internationally recognized symbols, individual Games emblems have been around for nearly 80 years. Wei Yew, an Edmonton graphic designer and one of the judges who chose the Vancouver logo, said one of the first recognizable emblems was created for the 1928 Winter Olympics at St. Moritz, Switzerland. For the olympic alpine skiing events. The design consisted of the Swiss and Olympic flags with a mountain in the background. "At the time it was more of a recognition element of the Games," Yew, author of the book The Olympic Image -- The First 100 Years, told The Canadian Press. Decades later, the commercial potential of the Games logo became evident at the 1964 Tokyo Olympics when it began appearing on pins, pennants and clothing.The logo consisted of the Olympic rings superimposed on the emblem of the Japanese national flag, representing the rising sun. "They started to sell well and people started to collect them," said Yew. The logo also generates profits through merchandising. Companies such as Bell Canada, Royal Bank and the Bay -- who pay to be official Games sponsors -- earn the right to use the symbol.